No single SPD (Surge Protection Strategy) can protect all the equipment in a residence from all causes of electrical surges. Instead, a whole-house protection strategy, consisting of point-of-entry and point-of-use SPDs, is necessary to help guard against disturbances from inside and outside the home. 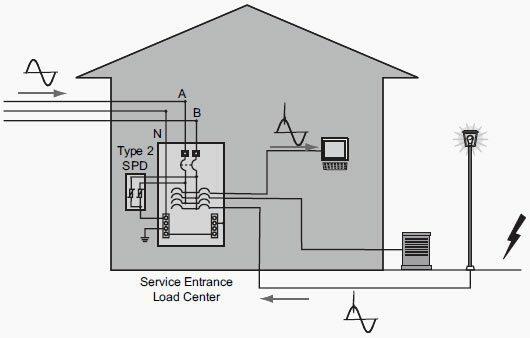 A point-of-entry SPD is necessary to limit damage from electrical surges entering the home via service entrance conductors. As previously discussed, these electrical surges can come from a lightning strike on or near high-voltage transmission lines, switching of primary circuits by the local utility, or equipment operation in nearby commercial or industrial facilities. Point-of-entry SPDs, however, cannot provide protection from surges developed within the home. For example, an air conditioner can cause a small electrical surge every time it cycles on or off. Surges caused by equipment within the home are usually weaker than surges caused by lightning; however, they occur more frequently. These surges are distributed throughout the home’s electrical system, possibly causing problems with other connected equipment. Additionally, many homes have some form of exterior electrical wiring. 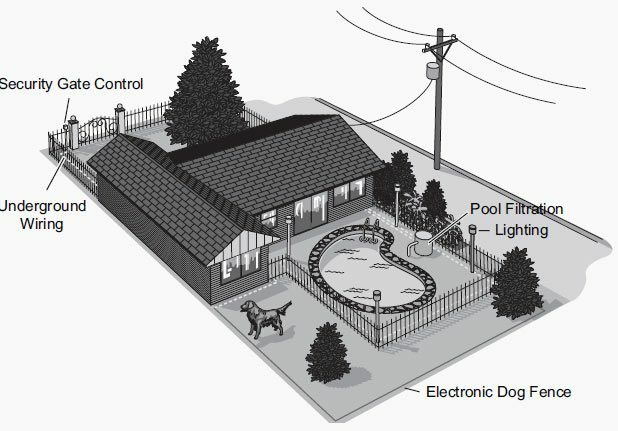 Security gates, outdoor lighting, electronic dog fences, and swimming pool filtration equipment are just a few examples of outdoor electrical devices in use today. 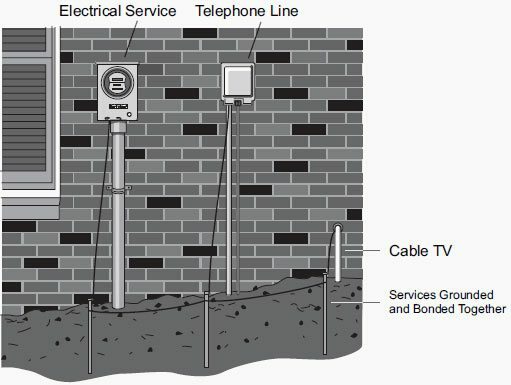 A cloud-to-earth lightning strike in close proximity to underground wiring can cause a voltage surge which has a direct path to the home distribution system. Most damage occurs from electrical surges that enter the home from outside services. We have already learned how lightning strikes can enter the home through the electrical utility. It is equally important to note that telephone lines and TV cables can also conduct electrical surges into the home causing damage to electronic equipment connected to these lines. The National Electrical Code® requires services to be grounded and bonded together. The purpose is to reduce fire and shock hazard in the event electric utility power conductors come in contact with communication conductors. However, this will not protect sensitive electrical and electronic equipment located within the house. Type 3 SPDs, also called point-of-use SPDs, are essential to any surge protection strategy to provide household equipment with a degree of protection from surges created in the home. In addition, point-of-entry SPDs typically have a relatively high clamping voltage and this allows some let-through energy that can be absorbed by point-of use SPDs. This is a very informative article pertinent to Pakistan where there are outages & surges of unknown dimensions. How to protect oneself. Is there anything as a protector gadget available in the market. . .